For me, Halloween is the official start of the holiday season and as an alumna of a University responsible for one of the most horrific films in the history of cinema, I take it seriously. I mean, I don’t spit green or anything but I always dress up and must decorate at least a bit. The problem with purchasing costumes and decorations in the store is that they’re usually poor quality (or too expensive) and end up spending the majority of the year in the closet. So, I like to improvise. This is the decorative display I’ve set up at Casa d’Aliana for all my guests (namely myself) to enjoy. It is deadly simple and eco-friendly! True, the ghosts are made of horrifyingly unnatural styrofoam but the blocks are components from curtain rod packaging that I’m unable to recycle. I decided they would make adorably simple ghosts and will probably be used again as packing material in the future. So what if my packing material has ghost faces on it? They’re cute! The jelly beans are the ghoulishly gross black ones in the variety pack that I never eat and I can never find anyone else to eat either. The pumpkin is just a pumpkin! 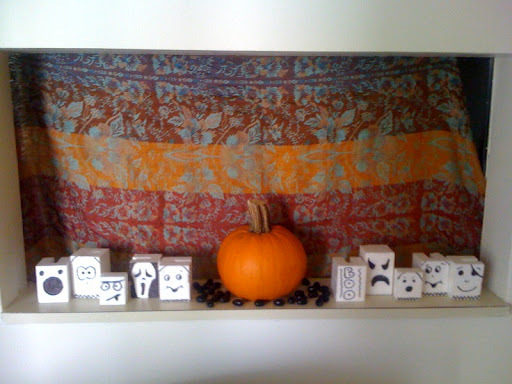 I like to keep mine au natural rather than carve or paint; my favorite color is orange after all. The backdrop is my scarf and primarily serves the purpose of blocking the view of pots and pans yet to be washed. Fancy, no?